Working for a travel magazine obviously has its benefits. While I’m not travelling the world 360 days of the year as many would believe, I do get to head away more than I would if I was working in most other jobs. Having said that, a large portion of my time is spent chained to my desk in the office, editing the work of people who are on the road for most of the year, and dealing with some truly fantastic photographers. What this means then, is that my to-do list grows by about two pages of A4 every day, so when I had the chance to nip over to Norway for a few days and hike Besseggen Ridge I couldn’t have been more excited, such were the enticing tales and astoundingly beautiful photos I had spent the past few years peering over. 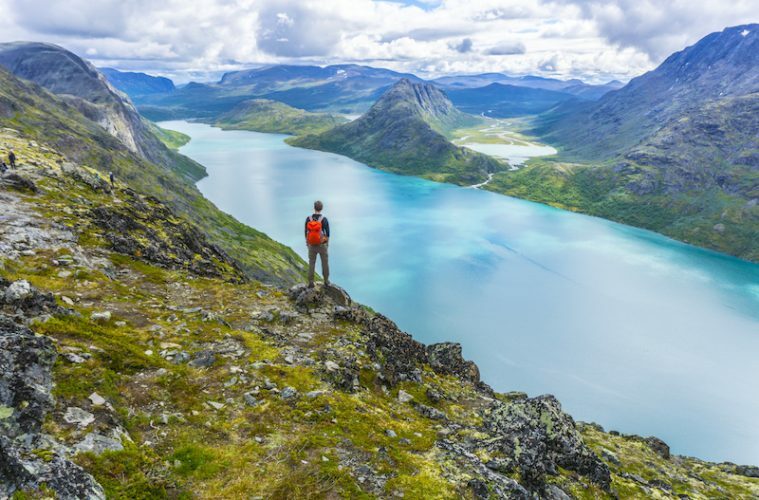 I was to be heading over to Jotunheimen National Park, a land of rugged, snow-capped mountains, impossibly turquoise lakes and wild, untamed plateaus in eastern Norway. It’s home to the highest mountain in Norway (and all of Northern Europe for that matter), Galdhøpiggen (2,469m), and offers more than 50 unbelievable marked trails, but there was only one in my crosshairs as I stepped off my British Airways flight in Oslo. 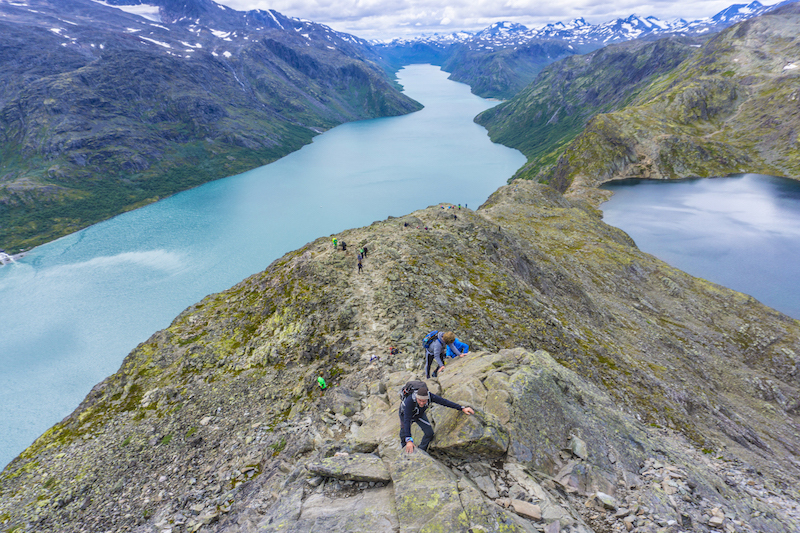 Within 24 hours of leaving that plane I would be ticking off the first few miles of the Besseggen Ridge hike, a walk so astoundingly beautiful that it draws in over 30,000 people every year. For a first timer to Norway like myself, any journey is sure to leave your jaw planted firmly on the floor. Within minutes of leaving the airport our train was carving through picture-perfect valleys flanked by pristine lakes. Almost every five minutes I was staring out the window in disbelief at the beauty which was stretching out before me, a feeling which didn’t let up for my entire visit to the country. Around every twist and turn there was another mountain I wanted to summit or another incredible waterway I wanted to explore. As it happened, I was heading to a place so stunning I had to pinch myself to check I wasn’t dreaming. My first night in Norway was spent at Bessheim Mountain Lodge, where I indulged in reindeer (when in Rome…) and rested up ahead of a big day to come. The twelve hours of travelling must have taken its toll on me as no sooner had my head hit the pillow than I was waking up to the morning light creeping around the curtains. Now, I’m normally the sort of guy who lies around for half an hour scrolling through Instagram and checking my emails, but with the prize of Besseggen Ridge lying ahead of me I jumped out of bed as if I was a five-year-old boy waking up on Christmas day. After a hearty breakfast and a short drive to Gjendesheim we were at the edge of Gjende, the lake which runs parallel to the ridge, waiting for a short boat trip to Memurubu, where we would start our 10-mile hike. The trip over the lake was cold and windy, but spectacular along every step of the way with the imposing Besseggen Ridge rising up steeply from the water, towering over us formidably. In mere hours we were to be scrambling up those steep and rugged rocks. In what felt like an hour, but was more likely to have been 10 minutes, I was planting my feet firmly on terra firma and heading toward the main track. We could see dozens of people snaking their way along the path up ahead, so we purposefully hung behind in order to peel away from the crowd. Out of Memurubu the track climbs steeply with large rocks forming a stairway toward the plateau above. It was a tough start, but I didn’t mind, as the regular stops to regain composure allowed the chance to turn around and take in the stunning view as it unfolded below. 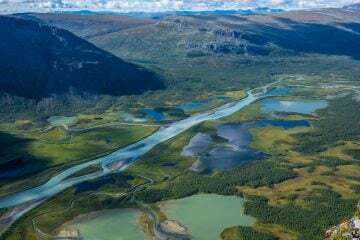 The River Muru careered downhill behind us toward the beautiful Lake Gjende, which had since taken on a brilliant shade of emerald, while the snow-capped mountains from deeper within Jotunheimen stood proudly in the distance. It wasn’t long before the layers previously keeping us warm on the boat were stripped and packed away. While it wasn’t all blue skies and brilliant sunshine, the mixture of cloud and clear skies more than added to the atmosphere and we felt blessed to have some protection against the heat of the sun. 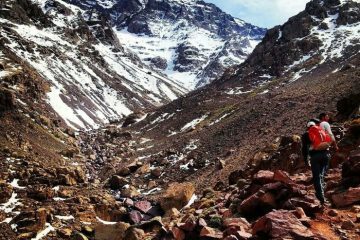 After that initial climb the track, marked regularly by a blood-red ‘T’, was more than manageable as it followed its way along the wide ridge plateau, gently rising and falling. 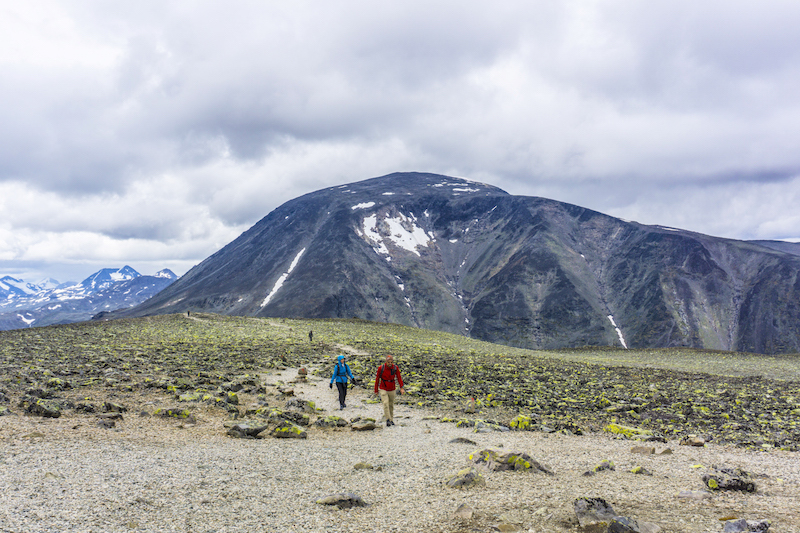 To our north stood Besshø (2,258m), while to our south Lake Gjende, with rugged mountains rising sharply from its southern shore, capped by glaciers and clouds that threatened to make a break for us throughout the day. It’s hard to quite put into words just how beautiful the scenery was during this walk and I would often find myself turning around to drink it all in. I lost count of the number of times the words ‘this is bloody awesome’ ran through my head. As we skirted along the side of Besshø, the famous Besseggen Ridge came into view once more. Ahead, I could see a couple of dozen brightly-dressed Europeans daintily picking their way up the ridge. Within the hour, we would be joining them. Before that though, lunch was calling, so we set ourselves down next to a small lake called Bjørnbøltjønne and tucked into our sandwiches. Refuelled and raring to go, we marched onwards and in no time at all we were descending a slightly tricky section of rock to an area referred to as ‘The Strip’. Now, you won’t find any fancy casinos or drunk Brits hanging out here. 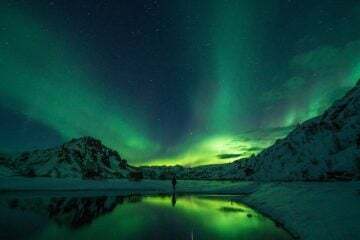 Unlike its namesake in Las Vegas, the strip on Besseggen is the narrow part of land which seperates Lake Gjende hundreds of metres below and Lake Bessvatn, which laps up toward your feet a few paces away. 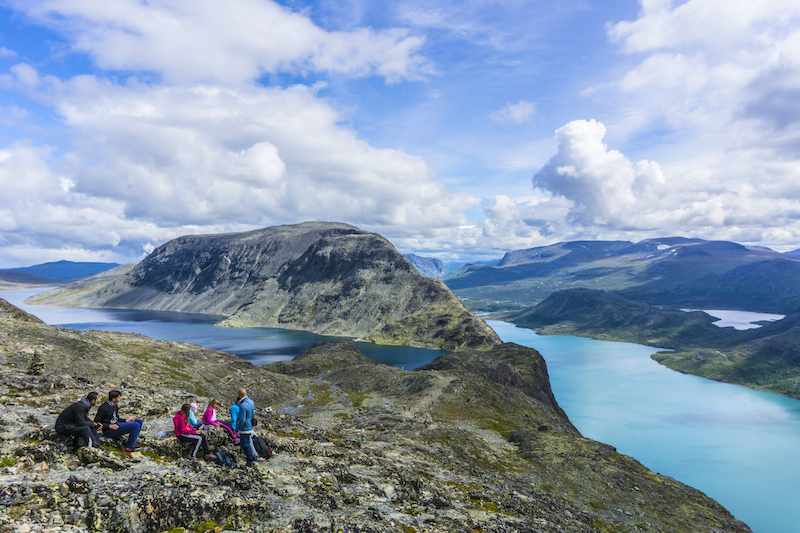 The stretch of firm ground is just metres wide and affords some of the most stunning views on the trail, though these are outdone as you climb higher up Besseggen. Once you’re finished with a rest stop and you’ve got your photos in the bag, it’s time for the serious part, an assault on the ridge as it rises up towards Veslefjell Mountain. For this part you’ll definitely need to take your hands out of your pockets as the path turns into a full on scramble. There’s nothing too technical at work here as there are plenty of big holds for both hands and feet, but it’s hard work and if you don’t like big drops you’ll want to avoid looking down towards Lake Gjende. It’s hard work, but it’s thrilling, and I couldn’t get enough of it. It’s important you don’t get caught up in the scramble though (as I almost did), as the views back from where you came only get better and better. With more altitude gained you’ll be able to see both Lake Gjende and Bessvatn lying out before you, one a deep blue and the other a bright emerald colour. It’s a breathtaking view. Looking around, I took a moment to gaze across Lake Gjende to the mountains, valleys and rivers standing so invitingly, while Besshø watched over us imposingly. 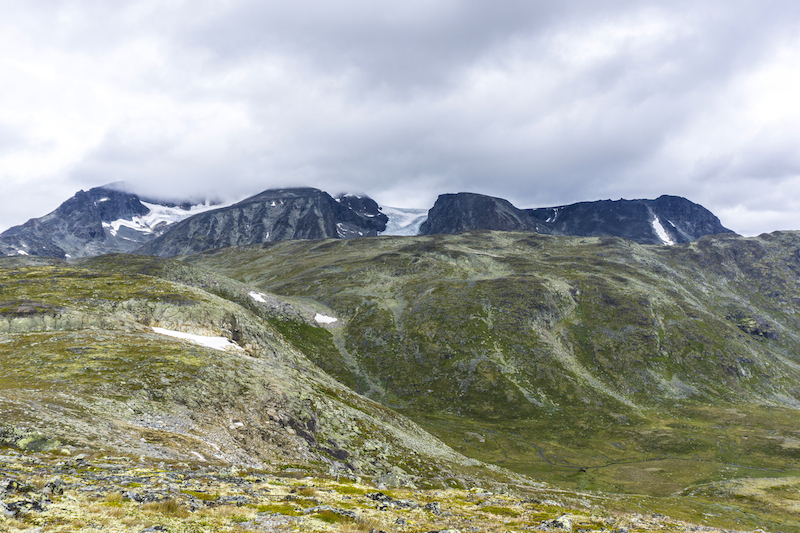 Beyond all of that, the snow-capped mountains of Jotunheimen lingered, sending my mind into a state of restlessness as it processed all of the peaks it wanted me to climb. In short, it was my kind of heaven. I continued up the ridge with a grin plastered across my face and contentedness coursing through me. ‘This is great!’ I thought, though the German slivering along on his belly next to me clearly didn’t share the same sentiment. Before long, the tasty part of the scramble was over and I progressed on two feet, turning around to take in the views as often as it was practical to do so. While the most exciting part was behind us, we had only just passed halfway and there was plenty of walking left. Having gained the main plateau to the east of Besseggen, we were now walking on fairly flat ground, so you might have thought the going would have been easy. Yep, I thought that too until I was picking my way through loose rock and shingle. Suddenly, the quick and simple few miles back to Gjendesheim didn’t seem so simple after all. As we picked our way across the rock-strewn plateau we reached a large pile of rocks signifying the summit of Mount Veslefjell (1,743m). While the wide plateau stripped away any views down toward Besseggen and the colourful lakes that flanked the ridge, we were still kept company by Besshø standing tall behind us and the snow-capped mountains rearing up in the distance. This section certainly wasn’t the most picturesque part of the hike, but with the rocks strewn across the plateau covered with strange green algae it almost looked like you were on another planet. With the weather starting to close in, the views only grew with interest and atmosphere. Luckily, we managed to stave off the worst of the weather, but the clouds were still encircling us, the wind was picking up and the rain was starting to descend upon us. Even so, we were still afforded pretty decent visibility. As we approached the eastern end of the plateau we were extremely grateful for this, as the stunning views returned. Both lakes from before were once again visible and had taken on a new, illuminating role against the backdrop of low cloud and dark, rocky mountains surrounding us. At last, our finishing point was in sight as Gjendesheim appeared at the bottom of the valley and the edge of Lake Gjende. With the final descent just a stone’s throw away, we made the most of the final viewpoint, and what a gift it was. As I peered over the edge of a very steep and precariously crumbly cliff, I took in the unbelievable views of Lake Gjende and the surrounding mountains once more. 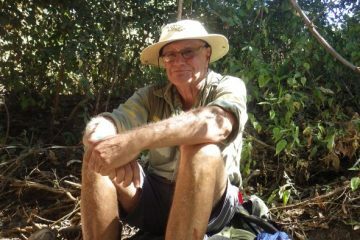 The final descent was a punishing one on the knees as we dropped a few hundred metres via the rocky track zig zagging down below. This was well and truly the final stretch, but with the aforementioned loose rock still underfoot and the challenge of a few large ledges with limited footholds, it was going to be a tough end. Spurred on by the promise of warm waffles, shelter from the impeding rain shower and the chance to take my boots off, I hastily descended. After a long hour, we had finally made it to Gjendesheim, and not a moment too soon. As we walked through the doors to the smell of sweet, sweet waffles the heavens opened, drenching those trailing behind in the process. We had done it! Besseggen Ridge was in the bag. All that was left to do now was to take a pew, grab some waffles and dig into some well-earned grub. What a hike. What a day… Norway had been on my bucket list for years, and even after taking on this epic hike, it’s going to stay on there. With friendly people, cheap flights and scenery that I only thought possible in dreams, this is somewhere I plan to return to over and over again. 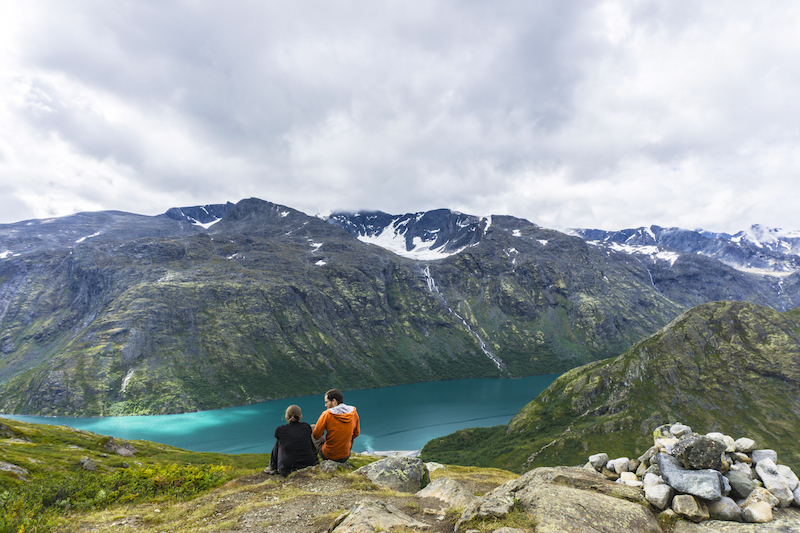 Flights from the UK to Norway are many and they are super cheap. If you book in advance you can often find return tickets from London for as little as £30 with the likes of Ryanair (hold luggage is extra), but even at peak times without much notice you should expect to get tickets well under £200. Once there, you can either hire a car (recommended) or get the train to Otta (the gateway to the national parks area) followed by a bus to Gjendesheim (the start point for the hike). 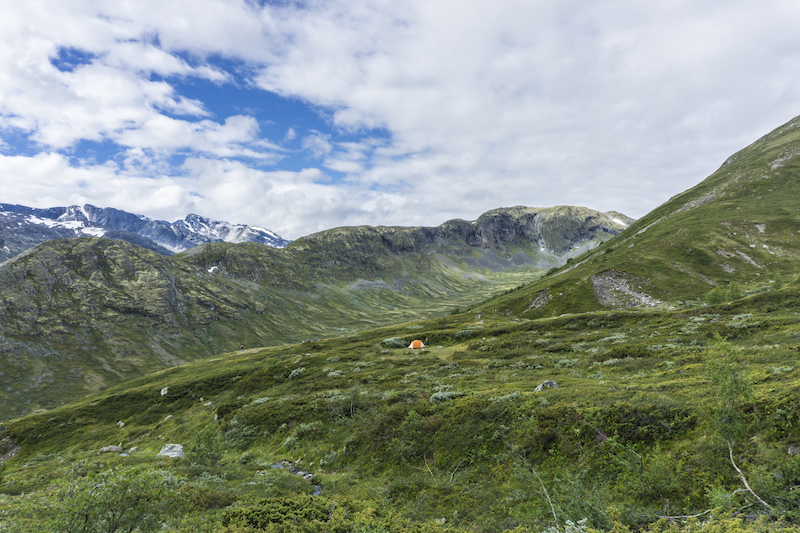 There is accommodation at Gjendesheim in the form of a Norwegian Trekking Association (DNT) hut which can house in excess of 180 people and is ideal for using before/after your hike. Nearby you will also find Bessheim Mountain Lodge and Cabins which offers great food, comfortable accommodation and fantastic views. Of course, wild camping is also acceptable in Norway as long as you camp more than 150m away from buildings and leave no trace. There are also DNT huts at Memurubu and Gjendebu. From Gjendesheim you are faced with several options. One is to hike Besseggen Ridge directly to Memurubu and get the boat back at the end of the day. Doing it this way means you not only face a time limit, but you’ll also have to tackle the ridge scramble going downhill, which is slightly tougher and, in my opinion, not as enjoyable. But it does mean you get to walk toward the best views. Alternatively, you can get the boat to Memurubu in the morning (as we did) and hike back to Gjendesheim. This means you can take as much time as you like on your way back and you also get the joy of tackling Besseggen Ridge going the other way. Of course, you could walk both ways, staying in a tent or in the hut at Memurubu overnight. There is also a track alongside Lake Gjende if you wish to mix it up. 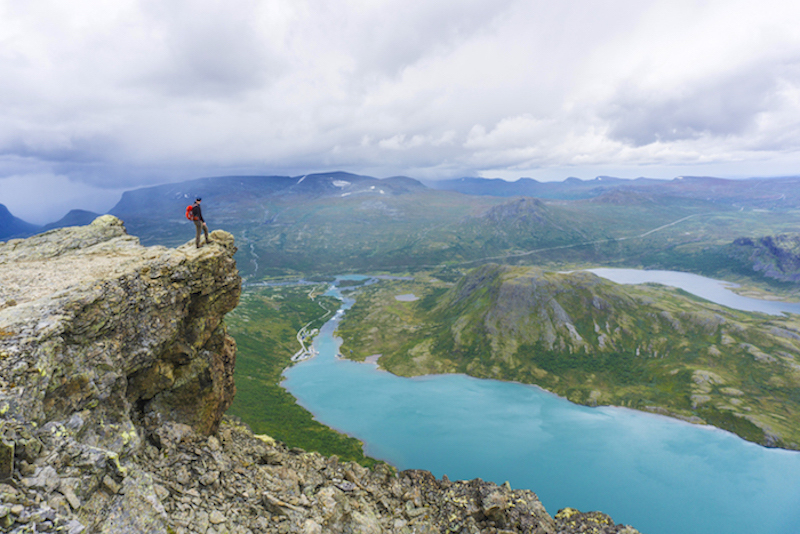 If you want a longer adventure, you could even link in Gjendebu further along the lake for a multi-day hike. Weather conditions in mountainous areas are notorious for changing quickly and that’s certainly the case here. Even if balmy temperatures and bright sunshine is forecast, be sure to take plenty of layers and waterproofs for all eventualities. 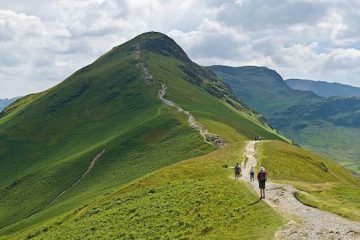 Sturdy boots with grippy soles are essential for rocky sections and you’ll also want to carry plenty of water and food to keep you going all day. 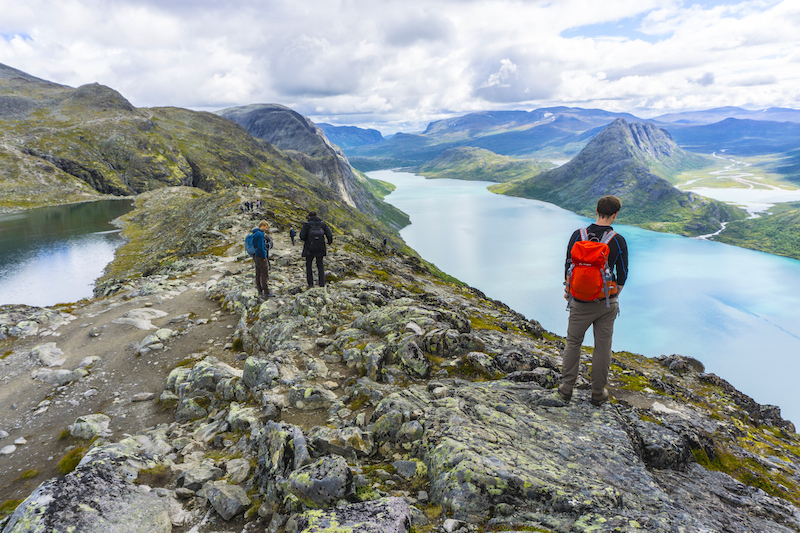 Unless you’re an experienced winter hiker, you’ll want to visit Jotunheimen National Park and Besseggen in peak season which runs from mid-June to mid-September. Weekdays are generally quieter than weekends, while starting early will also help you avoid the crowds. 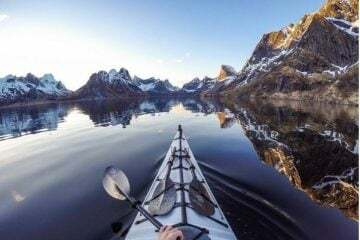 Check out the Visit Norway and Nasjonalparkriket websites for more information and ideas, or head to Best Served Scandinavia‘s website for a wide range of tours across the country.